Despite sales up 17% the Toyota Hilux remains #2 YTD for now. The Thai new car market is up another 3% year-on-year in September to 63.641 registrations, pushing the year-to-date tally up 0.4% to 556.525. Both market leaders Toyota (34.7% share) and Isuzu (16.4%) drop 2% on September 2015, whereas their direct followers Honda (+7%), Mitsubishi (+37%), Ford (+21%) and Mazda (+6%) all frankly beat the market. Hyundai (+41%), Mercedes (+47%), MG (+47%), Subaru (+57%), Dongfeng (+63%) and Kia (+67%) all take off. In the models ranking, thanks to sales up 17% year-on-year the Toyota Hilux continues to reduce the gap separating it from the YTD #1 position held by the Isuzu D-Max, down 5% in September. 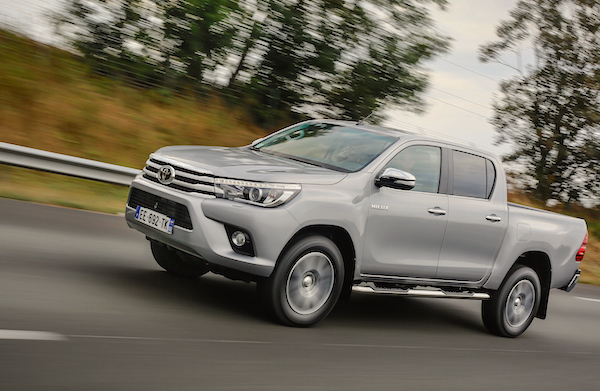 A 2.249 sales Hilux advantage in September brings this gap to 3.244 with 3 months to go. Notice also the Ford Ranger up 67% to #5, the Honda Civic up 256% at #9, the Honda BR-V down 9 spots to #28, the Toyota Sienta landing directly at #32 and the Toyota Innova Crysta at #62. Full September 2016 Top 35 All-brands and Top 70 models below.